Oh, so sweet. The story is what matters most. What a lovely story and what a bright 7-year old you have!! I love that binding, do you know what it is? Very, very nice! So glad it worked! What's the striped binding fabric?? I love it! 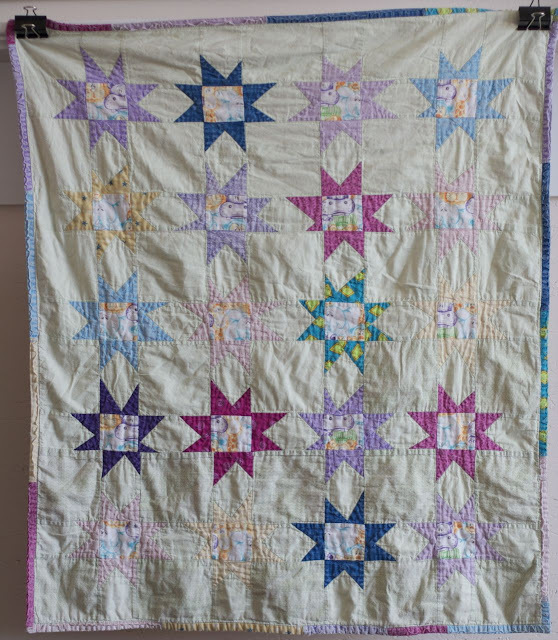 I found my daughter still was using her childhood quilt at the age of 38! It was one of my first and not so great, in my eyes, made with sheeting for the whites and huge blocks. But it was soft and cuddly, and getting VERY worn on the binding. [Some of it was dog fightss.] So I took it home and cut off the old binding. I had just enough of the SAME fabric still in my stash to rebind. And I made a few other repairs. Now it's back at her house and we are both happier. That is so sweet and I think it's cute that they are the same yet different. My girls have soft, broken-in quilts too. After giving them their "big bed" quilts for Christmas it was no problem to remove their hand quilted baby quilts from their beds. I'm planning to stitch sleeves on the backs and hang them above their beds for a few more years of enjoyment without more wear. There's no way I could find the right fabric to rebind! Adorable! Great colors and love the little girls in the center of each block. Both quilts look very cuddly. I'm glad it worked. Sometimes two years olds can be.... particular. Ha! So sweet. 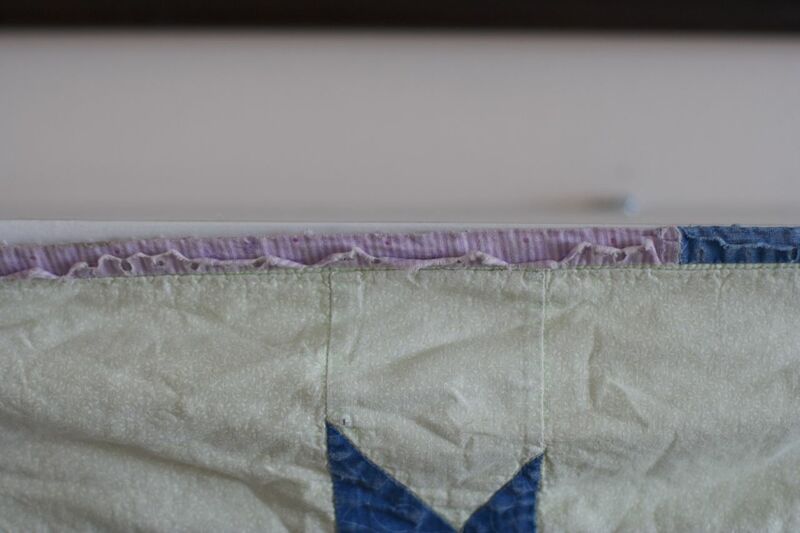 I kind of love the look of the worn out quilt but I know what you mean about not wanting to let it get completely threadbare! You have lucky girls! i love how much the first quilt is loved, and i bet the second one will be as loved as the first. i heart start quilts! Gorgeous quilts! Both of them! They are the sweetest quilts! ...and will be treasured Im sure. I love that story. 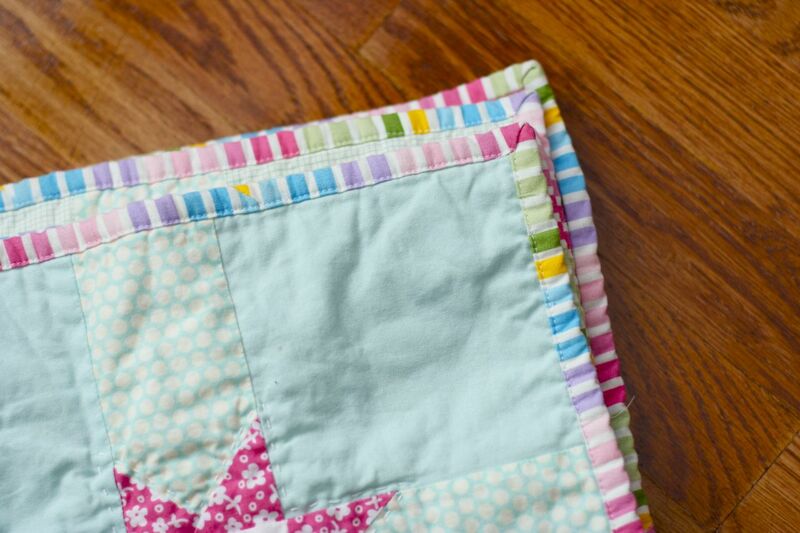 So sweet to know that your quilts are loved by those you love! Love the fussy cutting and the new color, it's gorgeous! Aw, I'm glad it worked out. And in the end how nice to have sister quilts for your sisters. Two adorable quilts. Glad it all worked out. I love your story. I'm so glad they both have a quilt now! The quilts are so sweet! 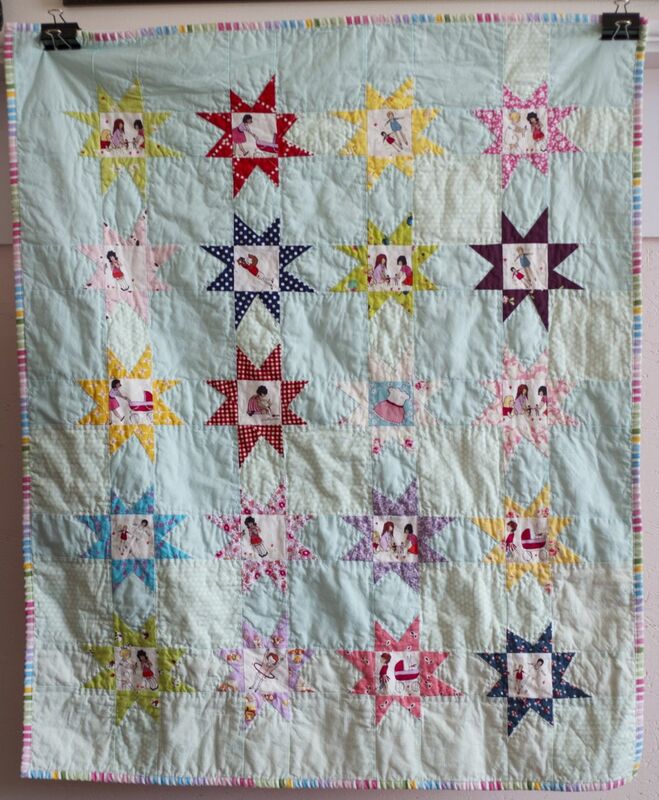 Awesome post, beautiful quilts & sweet little girls who will each have their very own special quilty gift from their mama - love it! what a sweet story! i love the binding. I just found your blog and am absolutely in love with this quilt. I am using Sarah Jane's fabrics right now for a quilt for my daughters. 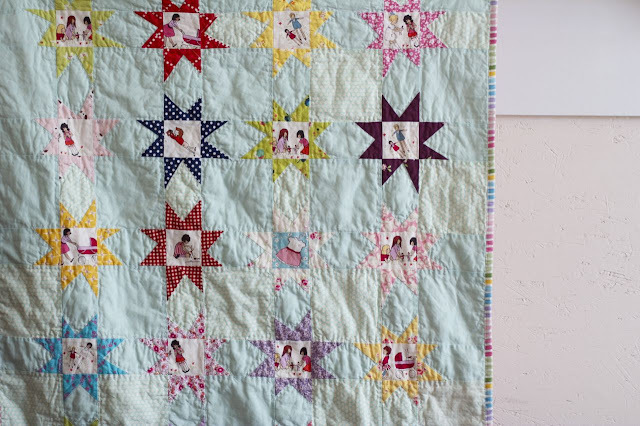 And I know I want to do a star quilt next, but this just combined the two so sweetly that I want to go sew it up right now. Thanks for sharing! Great story and both great quilts - of course you need to make another one! and another....?! 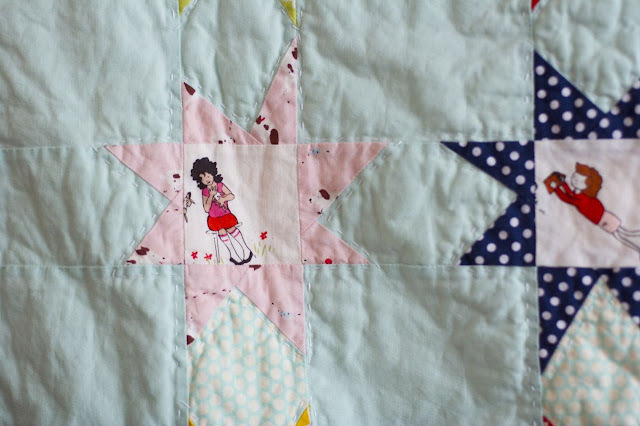 I also just found your blog and I love this sweet quilt! Question for you: Do you happen to know the name of the fabric you used as binding? Also the light blue with polka dots? Absolutely LOVE them together. Wow! 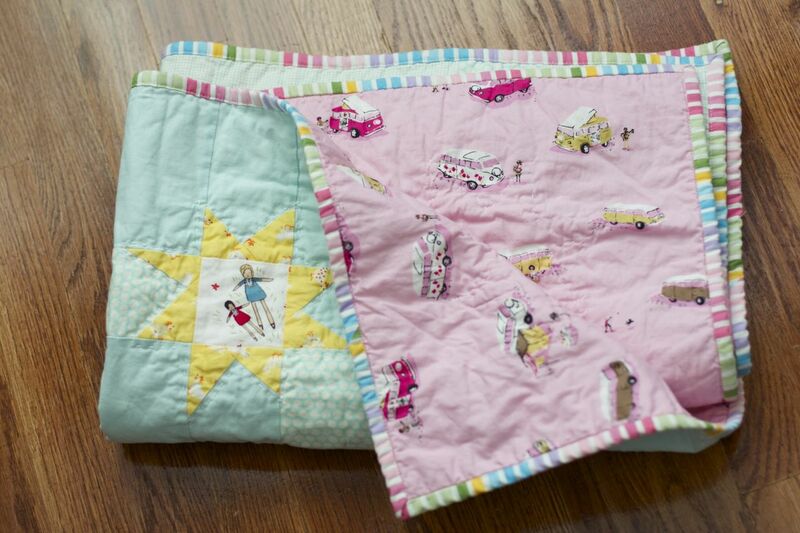 Both quilts are 100% charming. They are beautiful treasures for your little girls to dream under.